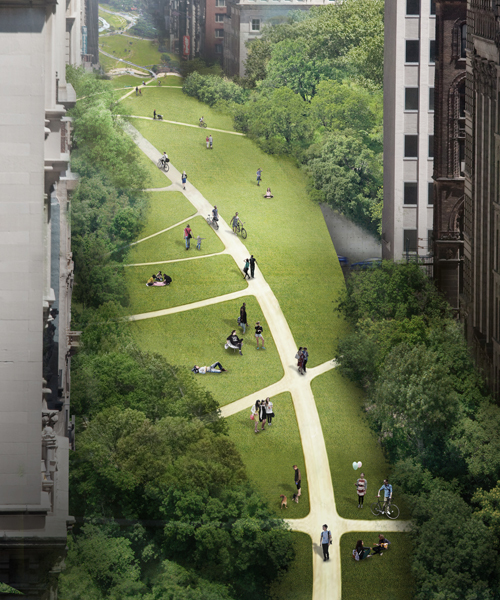 EDG has designed an elegantly simple ‘micro-highway’ named loop NYC. by reserving one lane of major cross streets (initially 14th, 23rd, 42nd 57th, 86th and 110th) and one lane in each direction on both the FDR and the west side highways for autonomous-only public transit, they propose to harness the resulting efficiencies of this coming technology to provide an inexpensive, reliable, sustainable and infinitely expandable mode of transportation. EDG calculates that the trip from grand central to lower manhattan, traditionally a 40-minute ride, could be completed in 11 minutes. this could save the average new yorker an average of 30 minutes on their daily commute, which, over the course of a lifetime, would yield the return of a full year. 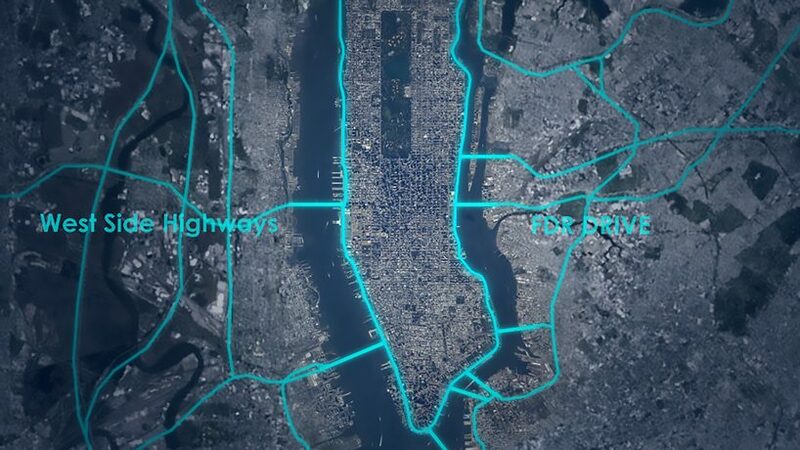 with the increased ease of commute both from the outer boroughs, and within manhattan, the number of cars entering the city and clogging our streets would diminish, alleviating traffic that would enable NYC to reclaim two streets to create a park running the 13 mile length of manhattan. 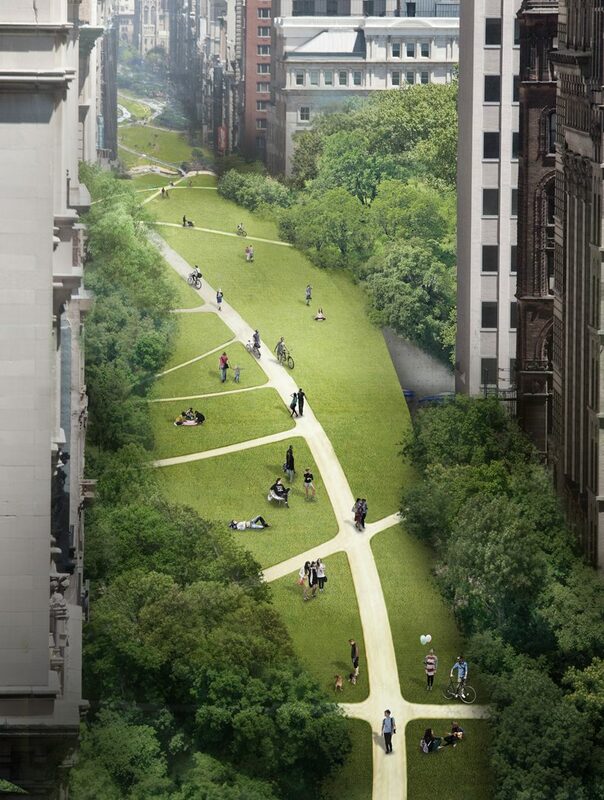 beginning in battery park, the pedestrian green would split at union square, continuing north on both broadway and park avenue. what EDG is proposing, is to create a pastoral park filled with bike paths, trees, and rolling hills over the tunneled cross streets below. 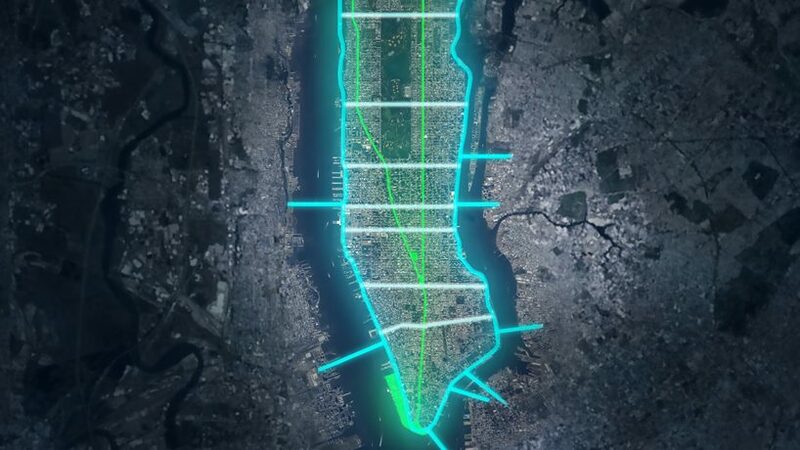 on broadway alone, this would create an uninterrupted 13.3 mile expanse from top to bottom, and by further expanding the median on park avenue, pedestrians and cyclists would gain the opportunity to ride or walk almost 24 miles up and down the length of manhattan, with access never more than six blocks from any of the cities inhabitants. the endless reverberations from this reclamation would truly upend urban life, as we know it. aside from the health benefits and quality of life issues derived directly from it’s use, it would also provide environmental benefits like air and water purification, wind and noise filtering, microclimate stabilization, and as we’ve now come to realize the importance post-sandy, increased drainage. socially, open space encourages use, which in turn, increases the social integration and interaction among neighbors. lastly, the economic benefits, from increased pedestrian traffic for the shops and restaurants, air purification by trees that reduces costs of pollution prevention; and, promotion of the city as a tourist destination. Lots of unspoken assumptions here. The driverless loops are primarily for out-of-town commuters, not “New Yorkers.” Losing so many major crosstown streets would imperil neighborhoods and devastate retail. The parklike north-south conversion of Broadway and Park to bike/pedestrian arteries, however, is promising, building on what Bloomberg did on Broadway from Times Square to Union Square. Thought-provoking start.